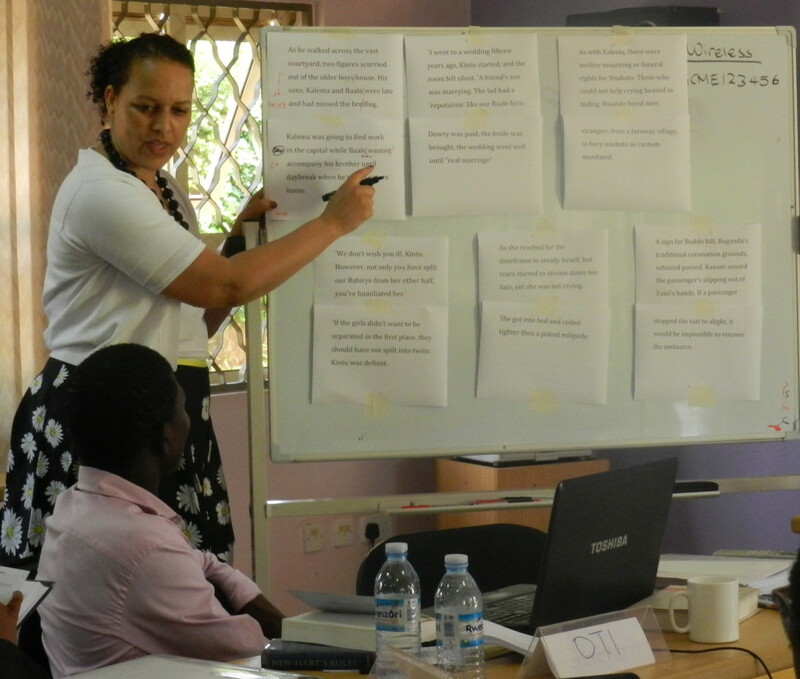 Vimbai Shire during the Editorial Skills Workshop in Kampala in June. Vimbai Shire is a freelance copy-editor, proofreader, manuscript reader and book designer with 15 years’ publishing experience in project managing, editing and/or designing non-fiction illustrated books, text-only fiction and non-fiction books, magazines and various printed materials for publishers, businesses, public and private sector organisations, institutions and individuals. Vimbai Shire’s company, Beyond White Space, has a wide range of clients including the African Writers Trust, the Commonwealth Foundation, Granta Magazine, Kogan Page, Kwani Trust, Laurence King Publishing and award-winning authors Jennifer Nansubuga Makumbi (she copy edited Kintu), Aminatta Forna and Leila Aboulela. 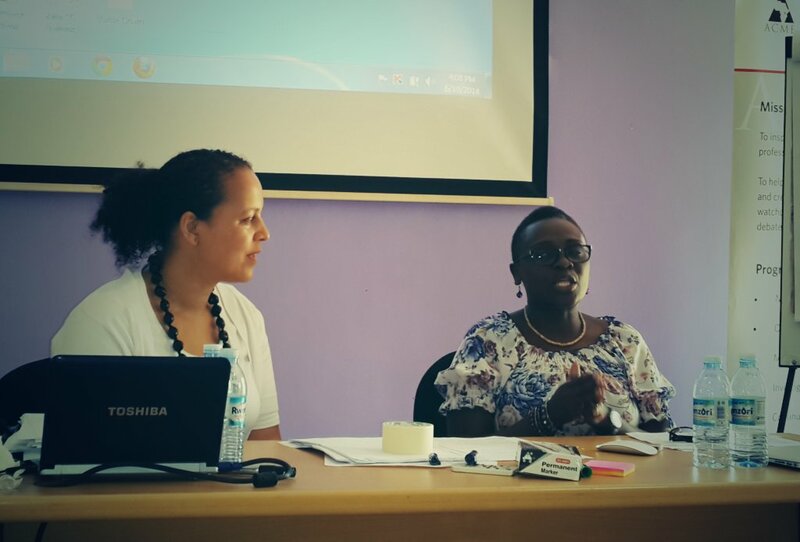 Vimbai was in Kampala last month to facilitate the Editorial Skills Workshop with Ellah Allfrey that was organised by African Writers Trust and Commonwealth Writers. She took some time to tell us about her business and life as a freelance editor. How did you decide to become an editor? I have always had a love of books. As a child books were very much an escape for me. I always had a book by my side and I have always been one of those people that noticed spelling errors and noticed what is not quite right. So it’s something that was always bubbling under the surface. I definitely had an interest in writing and I still do but I also like to know how everything works. So for example when I was learning how to drive, it was not enough to know that when I turn the steering wheel this way, [the car] also goes this way. I wanted to see and understand how the interior and the engine worked and my instructor thought I was a bit crazy. But that’s just the way my mind works. I just like to know the whole process of putting together a book including what it looks like and how to make it readable. I am not just looking at what a good story it is, I get a lot of reading pleasure when the typography is beautiful. It gives me a thrill. Did you have to go to school to learn what you know? Eventually, yes. After I finished high school, my first option was to go and study law. That is what you did when you did the Arts for A’ levels but I soon realised that that wasn’t going to be for me. I got married and had my family at quite a young age so when I moved back to the UK with my young family, I just could not see myself having a career as a lawyer and giving the energy that a young family needs. I thought editing was something I could do and work around my children because I could work from home if I needed to. So I started doing a bit of proofreading and very quickly realised that I couldn’t do it as a lay person. It is a very specialised skill and I wanted to find out a bit more about it and it just grew from there. What kind of school did you go to? There is a very good school (now called the University of the Arts London; then it was called the London College of Printing) that I went to for my degree. There are quite a number of universities now that are realising that there is an interest in editorial skills. There are a couple of private institutions as well and I’m really quite pleased about this. When I started it was looked down upon, you know, not quite academic enough and so on but I actually think these courses are really useful because they give you a complete overview of the industry. This means that once you go through those types of programmes you come out and you are ready to dive straight into work. As part of the course, they also give you exposure to different publishers and get you internship positions. That is how I got my first freelance position actually- through the institution I studied at and I was ready for it. I didn’t have to go in and think ‘Oh my goodness! What are proofreading symbols?’ because I knew them and had practised them several times throughout the course. People look at books and think ‘Oh, that didn’t take much to put together!” but you can see how much [work] is put in to get a book like Kintu to that published final version and to make it look as beautiful as it does. It takes a specialised skill and I am really glad it is starting to be looked at as such and as one that is worthy of study. Have you ever worked under a publisher or have you always been freelance? I have worked for a couple of publishers full-time, but learned the most from a small publishing house called James & James Publishers. Most of the publishers I have worked for have been fairly small to medium-sized, not the really big houses and for me that was really great. The reason I enjoyed that and got so much out of it is because it meant that I had to take on several jobs at once, which solidified the demarcation of roles, whilst allowing me the freedom to try my hand at different roles and see what I was good at. Even when I held one or two positions at that publishing house, everything was at close quarters, in one office. There are some bigger publishing houses where the editorial department is on another floor. There is one publishing house I freelanced for and they had their entire design department out of house and the editorial was in-house. You never got to see what was going on with the design once the work left your desk and that happens sometimes in larger publishing houses. You may not have a lot of physical contact with other departments, which is different in smaller publishing houses. But when everything was in-house we saw each stage as it happened and I learnt so much from being in that situation. The other thing with big publishers sometimes is that you may only get to do one job/role and that is all they ever trust you to do. At James & James I was given a lot of responsibility very early on, which really scared me in the beginning, to be honest, but it was great to know that my boss trusted me and I was able to ask questions when I did not understand something. It taught me a lot about being unafraid to make mistakes. Being unafraid to ask questions. Being unafraid to look for solutions if I didn’t have an immediate solution at hand. I had a wonderful boss – Hamish MacGibbon, who taught me a great deal and I am very grateful for that experience. It also meant that when I did set up on my own I was less fearful than I might have been because I had already seen a working model of a good publishing house that had a successful niche market. I was able to see how everything works. For me it was perfect. Do you employ other people? Not at the moment but I work with other freelancers so I sub-contract some aspects of the work occasionally. At the moment, my business offers editorial and design services so I mostly edit and design books. I do take on some other design projects as well but I don’t really advertise that so much because my passion is in books and I want to be known for books. How do you manage to do both editing and design? I have been described by a few people as a ‘rare breed’ in that you rarely find somebody who is competent in both design and editing. It is normally one or the other and I have to confess that when I started, people used to get really confused and ask how I could possibly do both but I had a lot of experience in both editorial and design and typesetting. I try not to do both at the same time on the same project but it does happen and I have managed it. I copy-edited and typeset Kintu, for example. At the moment I would say that 80 per cent of my business is editorial and 20 per cent is typesetting and design. The typesetting and design is something I can and do sub-contract if it gets to a point where things get really busy and fraught. I am less keen to sub-contract the editorial side of things, especially copy-editing and proofreading. It is something you have to check and so I wouldn’t feel good about getting some work and not reading it through myself. In instances where the project is particularly complex and I feel the need for a ‘second pair of eyes’ or where the deadline is really tight and the budget allows, I read it but might also send it out to another reader to check over. Then I will get both our marks together and see what I might have missed or what I might have picked up on that extra reading. That works quite well. Often my co-reader will spot something I missed and I will have marked up something that he or she missed. I judge and do what I feel is best for the book and what works within the budget and deadline, but I always read everything I’m sent. I have also co-read for colleagues as well and when there is sufficient budget for it, it makes for a better end result, I think. But even with the books, you don’t specialise in one genre. How much do you have to read/know to make you that flexible? I certainly wouldn’t put myself forward for something that is highly specialised – a medical text for example, because it is not my area of expertise but ultimately grammar is grammar, syntax is syntax and spelling is spelling and as long as the subject matter is not too complex or highly specialised, I will do other things and read any genre. I think it gives you a broader base and discipline. I learn something new from every single project and proofread I do. I am able to streamline my systems as I go and it gives me a challenge. It’s not for everybody but I enjoy the challenge. As a designer, do you ever buy books because of their covers? Not necessarily but if I see something particularly beautiful I will buy it, especially if it is an art book. I am very much attracted to beautiful cover design and interior design (beautiful typography) but those are things I probably do for inspiration as much as for reading. I don’t think I have bought a fiction book purely for the cover but it’s always nice when the cover looks good. If I am in a bookshop I will spend many, many hours just looking at book covers; just seeing what is out there really, and I do photograph covers if I see something particularly beautiful. While reading, do you get distracted by the design aspects of a book? If I am reading for pleasure? No. I try not to unless something is glaringly obvious. I mean, we have all picked up something that has gone wrong somewhere. I remember picking up a book, a recipe book actually, and something had gone wrong with the printing so the type was misaligned, with one layer on top of the other, but askew, like looking at 3-D without the glasses. When I see things like that I feel sorry for the production team because I know what it is like and how things can go wrong sometimes. It is such a shame to have something go wrong at the very end of the process, when everyone has worked so hard, but it happens. We’re human at the end of the day. What do you know now that you wish you had known when you were starting your business? I wish I had had more confidence in what we do as editors and recognised that it is a specialised skill. Although we are very much back-room technicians, I wish I had had more confidence in knowing that people get so much pleasure from reading a book that is well put together; well written and beautifully presented. There is an assumption (and this has increased with desktop publishing and self-publishing) that all you have to do is press a button and it will all get done. There is a lot more that goes into the making of a book and I wish I had valued that more. How do you get your name out as a freelancer? For me it’s been about doing the job, doing it to the best of my ability and inviting feedback afterwards. I always ask the client (especially if it is a new client) if they are pleased with the work I have done and if they mind recommending me to somebody else. 99.9 per cent of my work has come from word of mouth; somebody has recommended me based on a job that I have done for them. I’ve worked hard and been fortunate to get either repeat work or a recommendation (sometimes both) from almost all of my clients. I am never afraid of negative feedback. It’s not nice when people are not happy with this or that but very often it’s not that they were not happy with what you did but it’s usually that their expectations might have been slightly different from yours in the execution of the work. I always find that a conversation with the client allays those fears. It’s very rare that it happens and I can only think of one instance over the 15 years of my career where something has not gone quite right but we maintained a good relationship with the client afterwards because we were able to talk it through and it was about expectations. Had you heard of Jennifer Makumbi when you received the manuscript? When I receive a manuscript and I don’t know the writer I always Google them. So I did and that’s when I learnt that she’d won the Kwani? Manuscript Project Prize. I was really excited to work with an author from my home continent. I have worked with a couple of others and it is always a real thrill. Also having worked with Ellah Allfrey before I know that anything she sends me is going to be great. How was Kintu for you as a reader? In fact, I had an amazing experience the first day that I came actually. I had some free time so I had the opportunity to drive around a bit and as were on the way back to the hotel, at a junction, we saw about seven or eight men on motor bikes with huge branches and they were sweeping them about on the ground. the driver said, ‘It’s a good thing we passed before they came out otherwise they would have blocked the road.’ So I asked what that was about and he said the Kabaka was passing through. I was absolutely thrilled. I was like, ‘Oh, I know about the Kabaka’ because I had learned about baKabaka from Kintu. I was so excited. I didn’t see him but we saw the procession and it was a real thrill to see that those aspects of Jen’s story came to life before my eyes. Did any of the Luganda words throw you off? I speak Shona (my home language from Zimbabwe) as well as English so I don’t get thrown when I see a word I don’t understand. I don’t feel I need to have a literal translation. It doesn’t take anything away from the story, it just adds to it. Even when I speak with a Shona-speaking person, we will mix a bit of English and Shona and so I am used to that style. It has got a certain rhythm to it and I think I would have been surprised if I had seen no expressions at all in any local language. I did not feel I had to know what each and every word meant and Jen has got this really clever way of weaving the meaning into the sentence so as you go along you start to realise that this word means parliament [for example] and so on. I never felt at any point that I was lost. You said you learn something new from each project you work on. What copy-editing lessons did you pick from working on Kintu? One of the things that you have to watch out for as a copy editor, especially if a book is interesting, is how you handle the research. So that you don’t say, ‘Now I have to go read everything there is about the history of Buganda.’ It was something I was cautious about. You could start to Google something and get completely get carried away and go down so many rabbit holes. I had to be really disciplined because there were so many things in the book that were interesting to me that were outside the bounds of the copy-edit. Kintu disciplined me to focus on the story at hand. Thank you so much for taking the time to talk to us, Vimbai! How do I get in touch with Vimbai for her services.